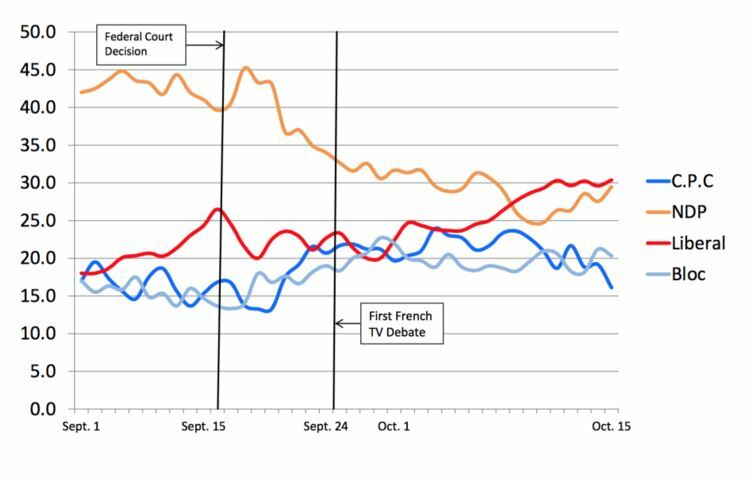 The Canadian general election campaign started off as what appeared to be a boring race. The Liberal Party was trailing in third and the centre-left New Democratic Party (NDP) was clearly in the lead. Yet it quickly turned into a heated three-way battle between the two progressive parties and the Conservatives. Only on 11 October, eight days before election day, did it seem that the Liberals were beginning to pull ahead (see Figure 1). What happened? At the start of the campaign, the NDP was on the verge of a historic moment as various seat predictions suggested the party could win the most seats – a first at the federal level. While the party still experienced its second-best result ever, it fell way below expectations. The NDP’s platform, focused on economic and social policies as well as democratic renewal, had a strong appeal to the middle class. They proposed making child care affordable, lowering the retirement age to 65, strengthening public pensions, and improving healthcare. The party’s leader, Thomas Mulcair, was perceived as a credible leader; he had been a Liberal environment minister in Quebec’s provincial government from 2003-2006. He had high approval ratings, and even Brian Mulroney, a former Conservative prime minister, estimated that Mulcair was “the best Opposition leader since John Diefenaker”. The problem, however, was twofold. First, the NDP promised to achieve their priorities while balancing the budget. And no, this was not problematic because a balanced budget necessarily means “austerity.” As I argue in greater detail in The Newstatesman, this promise didn’t fly with Canadians since the party promised to balance the books while simultaneously making spending promises which it couldn’t conceivably keep. When the full manifesto was revealed, it became clear that the NDP was offering a fantasy budget. It was about this time that the polls began to drop. Another problem with the promise of balanced budgets was that it gave up some of the NDP’s hold on the mantle of ‘change.’ The NDP was campaigning with the slogan ‘Change That’s Ready,’ while the Liberals were campaigning with ‘Real Change.’ When the Liberals announced that they were prepared to run small deficits for the next three years to make significant investments in infrastructure and public transport, they were perceived as the true agents of change. This promise wooed Liberal/NDP swing voters, especially the NDP voters who criticised their party for talking the “talk of neoliberalism”. The Liberals seemed to benefit most from this switch in Ontario, where their promise to invest in infrastructure and transport convinced many voters in the Greater Toronto Area. There are also a number of similarities with the 2014 Ontario election, where the Ontario Liberal Party (OLP) won an outright majority against all the odds. While the OLP campaigned to cut the large fiscal deficit, the party nonetheless had a coherent and realistic vision of how this could be achieved by embracing an activist role for government and investment in education, infrastructure and business. The provincial NDP faced many of the same challenges – being accused of tilting the party to the right to win over centrist voters. It shouldn’t be too much of a surprise that a significant number of OLP strategists were working in the Liberals’ war room during the general election campaign. Another key issue that led to vote switching away from the NDP was likely the niqab debate in Quebec. Former prime minister Stephen Harper had proposed a ban on wearing face coverings during citizenship ceremonies. The Federal Court of Canada had found the ban unlawful earlier this year, and the Federal Court of Appeal supported the decision at a ruling on 15 September. It became a thorny issue thereafter. Thomas Mulcair defended the right for women to choose what they want to wear, and as a lawyer, defended the decision of the courts. A significant part of Quebec’s francophone population, who until this point was largely supportive of the NDP, had a “strong, visceral, negative reaction to the niqab”. Curiously, the Liberals had the same position as the NDP on the niqab and suffered no backlash. However, their support in Quebec comes largely from the Anglophone community. Finally, Canada’s most western province was also another key battleground in the 2015 race. In 2011, almost the entire province was Conservative blue, with a speckle of NDP orange and one green seat. The 2015 results show an increase in NDP support, but it was a massive win for the Liberals, who won 17 out of 42 seats, with large majorities in most of them. Trudeau’s decision to begin his campaign in Vancouver, instead of Ottawa like Harper and Mulcair, was clearly a smart move. On top of fighting the Conservatives and the NDP in the province, more than half of the Greens’ 15 target seats were in BC, where the party was putting in significant resources. The Liberals spent a lot of time campaigning in the province, taking on a positive environmental stance which challenged the Green Party’s efforts. Where next for the NDP? The 2015 election campaign raises interesting questions on the NDP’s future electoral strategy. It will be difficult for the party to achieve government or even official opposition status now that there is a centrist party in power. The NDP’s best hope is that the Liberal Party delivers on its election promise to implement electoral reform. So far it remains unclear what kind of change will happen. The Liberals have indicated that there will be an all-party committee and a national engagement process where different types of reform will be assessed. Yet there is no guarantee that, even with electoral reform, the NDP will break past the 20 per cent it achieved this time. Many have argued that the NDP was a victim of strategic voting in a campaign dominated by an ‘Anybody But Harper’ sentiment. This is only partially convincing. In a first past the post system, strategic voting would imply casting a vote for the incumbent MP in opposition-held ridings and voting for the opposition candidate that had the best chance of winning Conservative-held seats. But the results tell another story: the NDP was wiped out in Atlantic Canada; in Quebec, the Liberals, Conservatives and Bloc Quebecois defeated most of the incumbent NDP MPs, and in Western Canada, Liberals beat both the Conservatives and the NDP. It appears that many people chose to vote for the Liberals despite, not because of, strategic voting. If the Liberals hold true to their promises, it is possible to imagine them being victorious even in a proportional representation system. The gender parity in the new Cabinet and Trudeau’s committee choices already signal the new tone of the government and its priorities. These are still early days, but in any case, progressives have much to celebrate. Note: This article was originally published on Policy Network on 13 November 2015 as part of its regular ‘State of the Left‘ series.